San Josè del Cabo Mexico – It’s just after eight on Saturday morning. The hotel is quiet at this time of day with only a few people on the beach catching some early rays. With coffee in hand I thought this would be a great spot to sit and quietly make notes. I no sooner got settled into my lounger when I spotted a whale spout and then another and another. 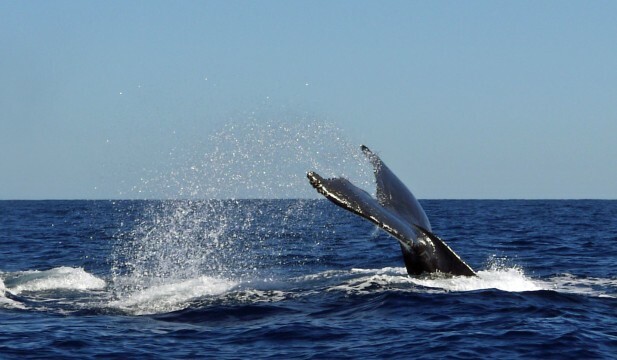 It was game on as they arched and breached and cavorted along the ocean’s surface before making a deep dive that signalled they were moving on to entertain another group of onlookers. What an awesome way to start my morning! I figure it was nature’s way of reminding me that you’ve got to do more than just sip the coffee, you’ve also got to savour the moment, wherever you are. Yesterday I had the distinct pleasure of spending time with one of the most gracious chefs I have ever met and a man with a vision. Nineteen years ago, Enrique Silva decided to move from “the front of the house” to the kitchen when he opened the Tequila Restaurant in the historical district of San José del Cabo. Despite the entrepreneurial challenges, Silva’s never looked back. Before becoming a restaurateur, Chef Enrique was an agricultural engineer, which perhaps is the reason he gives “farm to table” a whole new meaning. 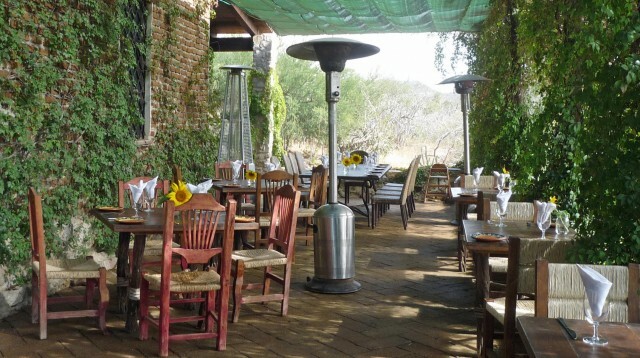 Thirteen years ago he bought a 17-acre farm on the edge of town where he grows organic produce to supply not only his restaurant and others in town but also his outdoor café and cooking school Los Tamarindos. As we navigate the dusty road surrounded by nothing but scrub, I’m wondering what could possibly grow here. Upon turning the corner, we enter a small valley tucked behind the estuary that is a veritable oasis in the desert. 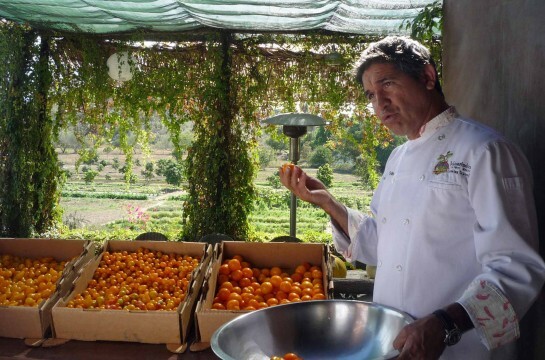 Chef Silva explains that not only is the soil rich and the water plentiful, but the surrounding hills have created a microclimate here that allows him to grow produce almost all year long. 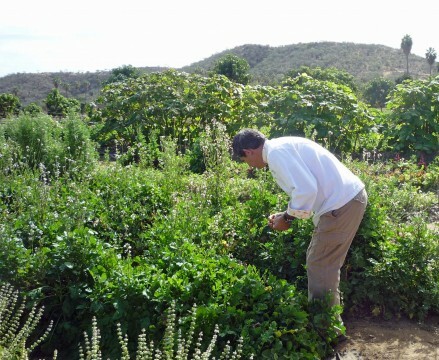 My culinary adventure begins with a tour of the farm where we explored row upon row of herbs and greens and more than a hundred different fruits and vegetables. Many of the plants are indigenous to Mexico. I learn that the Chef is also experimenting with seeds obtained from the many countries he has visited. Chef Silva’s goal is to continually hone his skills while creating an amazing culinary experience for his guests. As you wander the fields you’ll discover the art and science of organic farming while nibbling on arugula flowers and luscious tomatoes right off the vine. I learned that the wind is yout friend as it keeps insects at bay. Kelp and fish emulsion, administered regularly, provide the nitrogen young plants need to develop deep roots. The combo also helps in avoiding pesticides. I learned you can easily make an insect spray by combining soap with garlic juice or neem oil. I also discovered that the chalk painted at the base of his mango trees deters ants from climbing and taking up residence. These discoveries translate into simple ideas we can all use to maintain a greener, chemical free garden. I set to work in the kitchen with a delightful couple from St. Albert Alberta. We began wielding our knives to chop generous handfuls of assorted herbs including basil, parsley, thyme, rosemary, epozote, sage, marjoram and cilantro. These ingredients are combined with garlic, sea salt from Guadalupe, finely ground roasted black pepper corns, extra virgin olive oil, and sunflower oil to create a Mexican staple. We then use this fragrant herb oil to coat an assortment of yellow tomatoes before roasting them in the outdoor oven. The roasting process draws out the flavour and sweetness before blending the result for our simple, but savory soup. Next we husk and roast tomatillos along with green onions, garlic and a couple of serrano chili and poblano peppers. This concoction makes for a tasty salsa verde to complement our wood oven baked free range chicken. Meanwhile using tat soi, arugula, red lollo lettuce, romaine and yellow pear tomatoes Chef Enrique prepares a fresh salad that is made even more flavourful with the addition of a balsamic tamarind dressing. A meal this delicious would not be complete without dessert. Today we stuff zucchini flowers with soft ricotta cheese and top them with a mango paste and gently warm them just before serving. I’m not sure what I enjoyed more, the camaraderie in the kitchen or sitting out on the deck enjoying the fruits of our labour while sipping the perfect Margarita or a glass of chilled white wine from a local vintner. 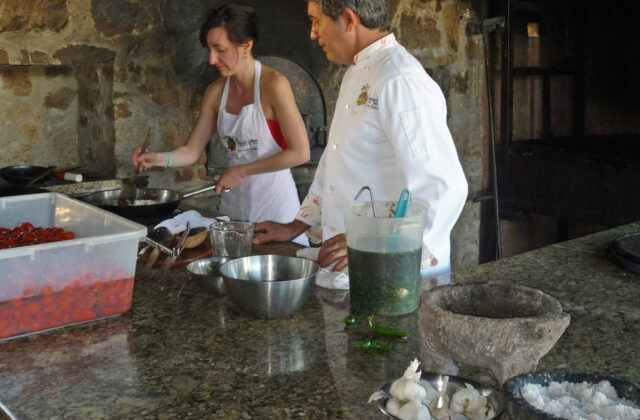 If the good life for you can be summed up by good food and good company, then plan on taking a cooking class at Los Tamarindos with Chef Enrique. 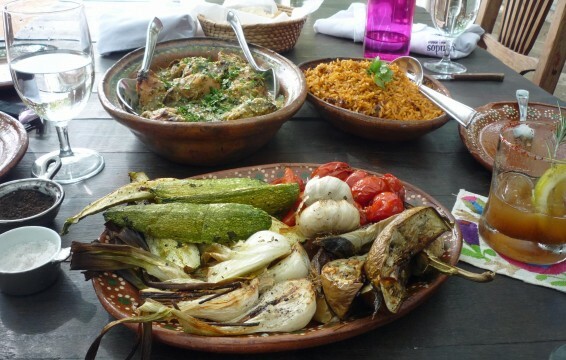 Not only will you meet new people and share an exquisite meal, but you’ll also know how to recreate the flavors of your Los Cabos vacation back home. Comer con gusto!